This weekend’s Guardian newspaper (a UK broadsheet) included the annual Superbrands 2016 supplement, which inevitably caught my interest. Billed as ‘independently commissioned research to identify the country’s leading brands’, the report reflects ‘the opinions of thousands of members of the British public and business professionals’. And then I got to the results page. 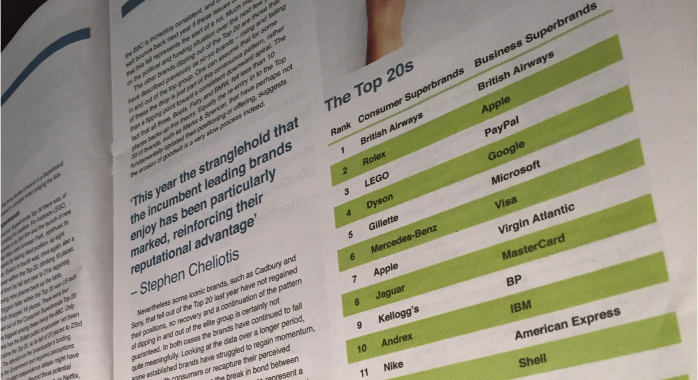 It appears the throngs of individuals who took part in the survey, somehow managed to collectively deem British Airways (BA) worthy of the top spot in both the consumer and business Superbrands list. Besides the fact that I still can’t fathom what constitutes the make-up of a so-called ‘Superbrand’, statistically it would be untenable to have such homogenous representation among respondents. Somehow, the masses magically voted in favour of the same brand. Twice. The methodology for conducting the research was undisclosed by the Superbrands team, and it would have made for an interesting read to decipher how they shortlisted over 1,600 companies as diverse as Amazon, Lexus, Bloomberg and Ocean Spray for the top prize. The vast majority have nothing in common with one another, so what selection criteria is applied? In fact, what does it even mean to be a ‘Superbrand’ anyway? The riddle of how you benchmark and measure the worthiness of lets say the British Medical Association, versus a services firm like KPMG, is something I’ll just have to ponder over to the grave. So BA beats companies like Microsoft, Dropbox and Teradata to nab the top business brand accolade. The latter are companies many professionals will instantly recognize. We use their products every single day of our working lives, because they help make things a little easier, a little more efficient. And while I have nothing against BA, I recall at least three tech companies I’ve worked at where BA was barred from the corporate travel booking system. Rumor has it they’re expensive, ungenerous with their travel perks programs, and not particularly business-friendly. Complete garbage. So perhaps Uber and AirB’n’B just failed to ‘qualify’. My point is this; Marketing’s already an easy target when it comes to critique, and it makes me cross when pseudo-scientific surveys like this are paraded around to further damage the credibility of brand measurement sciences. Let’s just call Superbrands what it is: a glorified sponsored advertising supplement. There’s absolutely nothing wrong with that, but I’m all for calling a spade a spade.